I made cherry dumplings for the first time yesterday. Is that sucha big deal, no not really. I had never really heard of them until my hubby talked about them on Thanksgiving. His sister wanted his mother’s recipe and so he asked my FIL for it. I guess I need to point out that I have never met my MIL. She passed away when my husband was still in high school. I also need to point out that although I am 100% Polish, my husband is not. His mother was Chzech and although the two are like kissing cousins they are not the same. Hence the cherry dumplings. I had never even had them before yesterday. Since I had decided to make pierogi I thought I would also add the dumplings into the mix. The dough was similar, and so was the process of boiling the dumpling. Plus my husband would get the sparkle in his eye when he asked me to make the dumplings-how could I not make them? I had questions about the recipe that my FIL had given me so I asked my SIL. My FIL is 82 and can get confused. This recipe was in his handwriting but I knew my SIL could straighten out any of my concerns, right? What kind of cherries do you use? Do you really serve it with onions? Things like that. I should have been more careful. First the hubby tells me they are not a dessert but a meal. Really?? I prepare the pan for the onion to saute and he tells me no that’s not what you do. But your dad’s recipe says saute. No and the onion needs to be diced really small. Where is the cinnamon sugar? But your dad’s recipe says just cinnamon. Where is the melted butter? Why aren’t they shaped like golf balls? You know you don’t fry them in the pan like pierogi. I shaped them like my pierogi. I was on a roll and thought they looked fine. I started in the kitchen at 9 am and finished around 2 pm. Meeshie helped me and I had the iPod so the time flew, but still. The dumplings tasted fine in the end but I knew better. My SIL thought I knew what I was doing. So did the hubby. 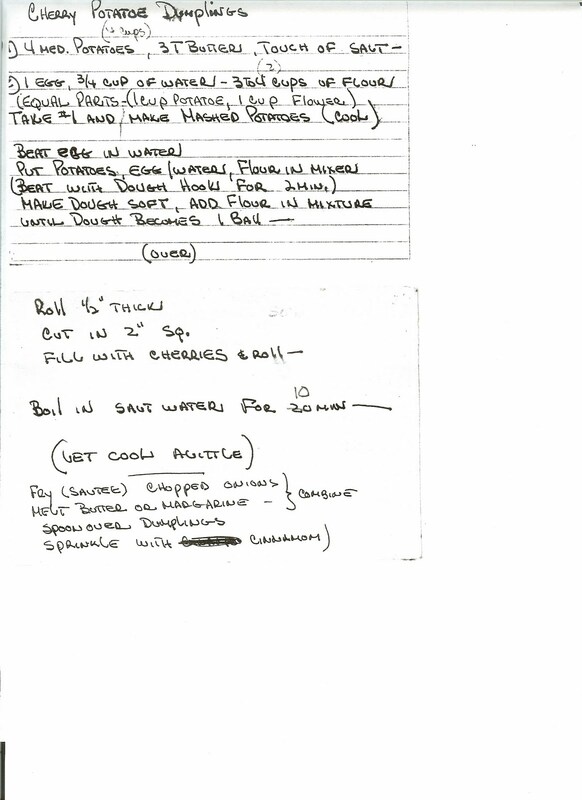 Oh-Here is the original recipe from my FIL. Don’t you love the spelling? A must state againg that I did not follow the dough recipe for these dumplings becuase I made my pierogi dough instead. You are currently browsing the archives for the Cherry Dumplings category.